This possibly unique 1886 Philadelphia Quakers team cabinet includes 17 members of the Quakers squad, two of which are prominent Hall of Famers Harry Wright and Tommy McCarthy. Issued by photographer Charles Konechty from the Philadelphia based Canyon Artists & Photographer studio, the cabinet measures approximately 4-1/4" x 6-1/4" and reveals a lightly contrasted sepia-image that has somewhat defied 133 years of potential wear to retain many of its original technical attributes. The storied past of the Philadelphia Phillies traces its roots back to 1883 when sporting goods manufacturer Al Reach and attorney John Rogers won their battle for an expansion National League franchise for the beloved city of Philadelphia. The National Association provided them with a place in the league, replacing the Worcester Brown Stockings, with the new ball club called the Philadelphia Quakers. From 1883 to 1886, the Quakers would play their home games at a Philadelphia field named "Recreation Park" which was bounded by 23rd Street, Ridge Avenue, 25th Street and Columbus Field, eventually leaving this landmark ballpark to play in the legendary Baker Bowl. Due to a horrific last place finish in their inaugural season (their record was a dismal 17 wins vs. 81 losses), they recruited the iconic manager and "Father of Professional Baseball" Harry Wright. Although the team only managed to win 39 games under their new manager in 1884, they did add an additional 22 victories and escaped last place, finishing ahead of two teams. 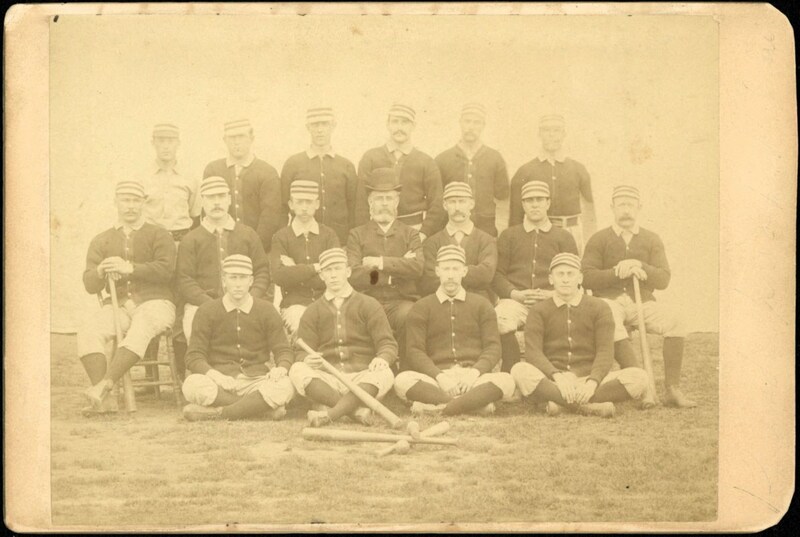 After breaking the .500-mark in 1885 (56-54), the Quakers would enjoy a fine 1886 campaign, compiling a superb 71-43 record that placed them fourth in the National League. It was the excellent pitching of 30 game winner right-hander Charlie Ferguson (1.98 E.R.A.) and southpaw Don Casey (24 wins; 2.41 E.R.A.) that ably assisted the Quakers in finishing 28 games over the .500- mark. It was during the 1886 season that Charles Konechty would issue this historic cabinet card that most significantly includes the iconic Harry Wright, sitting in the second row/center, and portraying his dapper formal attire and classic top hat. Regarding Wright's significance to the grand ole game of baseball, it is virtually synonymous with our Nation's founding fathers. Washington, Jefferson, Franklin, Madison, Hamilton, just to mention a few, were responsible for building America, and likewise, it is Harry Wright who meticulously created the building blocks that helped shape our National Pastime into the game we so zealously treasure today. Wright joined the mid-west Cincinnati Red Stocking as a pitcher in 1867, and by 1869 they toured the entire country, not losing a game until the Brooklyn Atlantics upset them on June 14, 1870. By that time, his Red Stockings were the first baseball players to receive a salary for their play, and were the talk of the country with thousands of avid fans crazing baseball mania. Wright seized this opportunity to create the first professional baseball league with the National Association established in 1871. Professional baseball was now ready to steal the hearts of millions of Americans, leading to its iconic designation as our country's National Pastime. Many of Wright's innovative ideas still exist today including pre-game practice, a live cork centered baseball, and, most important, overhand pitching. Additional exploits included patenting the first official scorecards and designing the basic uniform still worn today with knee-length knickers rather than pantaloons. Henry Chadwick, who is generally considered "the father of baseball", summed up Wright's unparalleled contributions when he dubbed him "the father of professional baseball"! While not as formidable a fixture as Wright, Cooperstown inductee Tommy McCarthy was also on the 1886 Quakers squad. The superb 19th century outfielder posted a stellar .292 lifetime batting average, was a defensive standout, showcased awesome speed and was of the finest bunters who ever played the game. The cabinet itself reveals the aforementioned HOFs H. Wright and T. McCarthy, with other prominent Quakers including Deacon McGuire, Joe Mulvey, Jim Fogarty, Ed Andrews, Charlie Ferguson and Don Casey. While no obtrusive flaws impede the central team image, there are numerous soiling spots along the pink hued borders (as well as a modest soiled spot directly beneath Wright's left hand), and the upper and lower right corners reveal significant wear. No glaring creases are evident, and the verso depicts the critical violet ink photographer stamp that reads as follows: "Charles F.A. 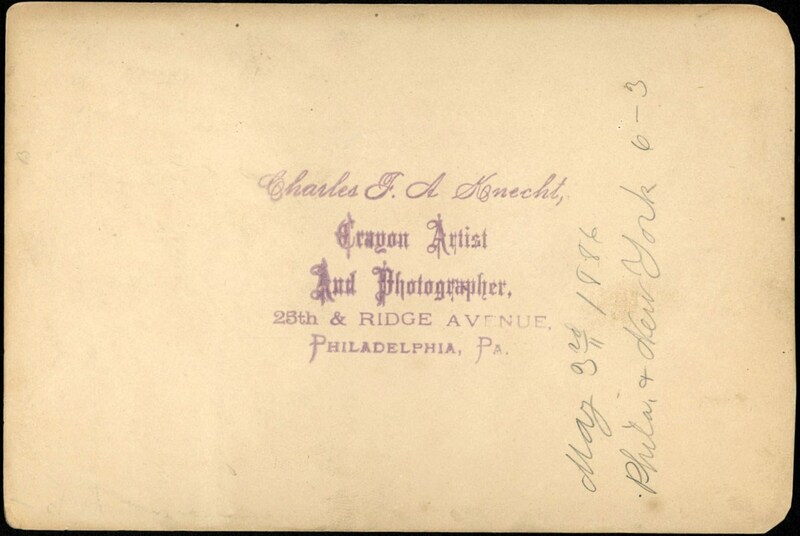 Konechty - Canyon Artists & Photographer – 25th & Ridge Ave., Philadelphia PA." Of interesting note, someone has previously scripted in pencil: "May 3rd 1886 – Phila vs. New York 6-3" on the reverse side. It was that date that the Quakers officially bested the N.Y. Giants by a 6-3 score, leading us to believe this cabinet was possibly issued at that approximate period of time since Konechty's studio address was situated directly by the Quakers home field at 25th St. and Ridge Ave. In closing, this miraculous heirloom literally transcends time to an era when baseball was initially paving its way as America's eventual pastime, with its amazing origin and possible "one of a kind" standing meriting it the finest accolades among the hobby's most sophisticated 19th century collectors!